IndiGo's share sale will raise the company’s retained earnings to Rs 2,680 crore. The proposed sale and issue of fresh shares by IndiGo can fetch India’s largest airline Rs 5,370 crore (Rs 53.7 billion), providing a major impetus to its expansion plans. The airline has announced the sale of 33.6 million shares, 22.3 million shares through fresh issue, to institutional buyers in order to comply with rules for companies to lower promoter stakes and achieve a public shareholding of 25 per cent. Back-of-the-envelope calculations show the number of IndiGo shares after the issue will increase from 361.5 million to 383.98 million, which will raise the company’s retained earnings to Rs 2,680 crore (Rs 26.8 billion). Retained earnings refer to net earnings not paid out as dividend but retained by the company to be reinvested in its core business or to repay debt. IndiGo sat on a cash pile of Rs 4,633 crore (Rs 46.33 billion) at the end of 2016-17. The amount rose to Rs 9,343 crore (Rs 93.43 billion) if investments and other such holdings are added. Rival low-cost carrier SpiceJet had cash reserves of Rs 201.02 crore on March 31, 2017. IndiGo needs the cash. Going by the airline’s announcements, it will in November start regional operations distinct from its mainline operation. It will also participate in Air India’s multi-year stake sale process and acquire wide-bodied aircraft for long-haul operations. IndiGo will spend at least Rs 10,000 crore (Rs 100 billion) for acquiring 40 ATR-72s and 14 A320 neo between 2017-18 and 2019-20. “At a price of $25 million per aircraft, the capex for the ATRs is Rs 6,500 crore (Rs 65 billion). At $35 million per aircraft, the capex for the A320 neos is Rs 3,200 crore (Rs 32 billion), including sustenance cost. The total capex stands at Rs 10,600 crore (Rs 106 billion) spread between 2017-18 and 2019-20,” Ansuman Deb of ICICI Securities wrote in a research report on September 12. He had not factored in the cost of acquiring the new wide-bodied aircraft, possibly the A330 or the A350. Delays over engines for the A320 neo have disrupted the production line of the aircraft and forced IndiGo to add capacity from the secondary leasing market. This has pushed up the airline’s operational expense due to higher maintenance costs of older planes and also because secondary market leases do not offer discounts like those offered by aircraft manufacturers. IndiGo is mulling wet lease of aircraft for the winter schedule. “IndiGo has stated it will procure aircraft, a change from its earlier asset-light model. Ownership is known to help airlines reduce cost over longer tenures, although this needs upfront investment,” SBI Caps wrote in a research note on September 12. 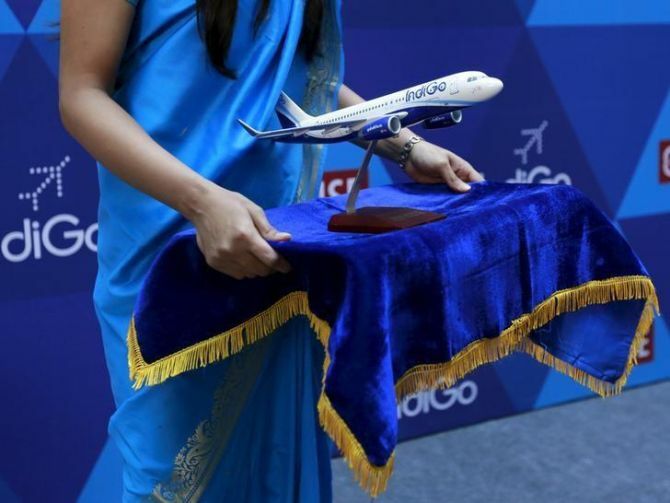 An IndiGo executive said the airline would likely have a fleet of 350 aircraft in the next five years. “We will invest in building capacity. We believe there is significant potential in increasing scale in India,” he said. Airline pilots, moles and motor cars!